Most people who are seeking a suitable countertop are surprised at the vast benefits of a modular granite countertop. For the most part, a modular granite countertop provides the same benefits as a traditional slab granite countertop. The major difference is in the price of the surface itself as modular granite is much less expensive than purchasing custom granite slabs. The system to manufactur modular granite countertops is relatively simple. Once the countertops are measured for the individual countertop, the pieces are cut into squares that when assembled will custom fit the cabinet. The squares can even be custom cut prior to shipping to accommodate sinks or cutting boards. They are entirely composed of 100% granite stone and unlike granite slabs, are much more affordable. The price should not reflect the properties of this natural stone however because modular granite countertops are just as durable as the conventional slab countertop. Countertops made of modular granite are resistant to heat just as its predecessor. It is flame retardant and will not leave marks from hot pots that are set on the surface. Scratching and staining the surface of a modular granite countertop are just as difficult as the traditional granite slab. The surface can be used to cut on, slide dishes across without any evidence remaining. Accompanied with the same valuable features as the granite slab, modular granite countertops are also much more versatile in color options. Unlike its close relative, modular granite offers many different selections to complement any kitchen. It is virtually unheard of that a granite slab countertop is accompanied by a backsplash. This is a downfall for many individuals who recognize the importance of preserving walls behind food preparation and cleaning areas. For those who desire this feature in the kitchen, modular granite backsplashes are the perfect match with the countertop to provide a beautiful finish. The backsplashes are widely available in many different forms such as smaller granite tiles or solid strips of granite cut to predetermined measurements. They are incredibly simple to install and can easily be accomplished over a weekend with a Do-It-Yourself attitude. Modular granite countertops are surprisingly simple to install and can save hundreds of dollars in installation costs. The right set of instructions, a few tools and some invested time will produce a kitchen you won�t want to leave! Granite is one of the hardest materials known to man. With that knowledge, it isn�t difficult to understand why modular granite countertops could benefit any kitchen. A chopping block, a hot plate; this countertop is a multi functional investment. It is also extraordinarily dense which prevents stains from forming on the surface. For once in history, it isn�t the sharp knives damaging and destroying the countertops! With granite or modular granite countertops, it�s more sensible to save the knives and use a cutting board to protect the knives longevity. 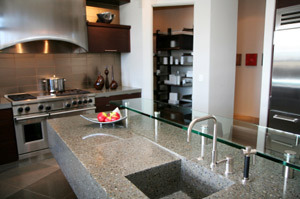 Using granite as a surface material in any kitchen, commercial or residential is a healthy decision. Granite is incredibly easy to keep clean and is not prone to absorbing moisture that promotes bacteria growth. Modular granite countertops are easy to clean and keep sanitary without the aide of harsh chemicals. They high shine that granite displays will not fade with time. Usually kitchen countertops are surrounded by windows that allow harmful rays from the sun to damage and lessen the look over time. Granite is not damaged by the sun and the colors will never fade! Remember that there are many different materials available to create a beautiful kitchen countertop. As the decision is made, it is imperative to think about they type of lifestyle that the kitchen is subject to on a daily basis. Fully research the level of maintenance and durability of the individual material and choose accordingly. Every countertop requires some type of maintenance and remember; with good knowledge, any material chosen can be a beautiful focal piece in the kitchen for years to come.